It seems that "Black Monday" has been averted, with global risk sentiment making a full reversal to start the week, and the precipitous selloff from Thursday and (Black) Friday turning into a furious rally on Monday, starting in Asian markets and proceeding to Europe and US stock futures, which are up 1.4%, and back over the key 2,610 support level. In other words, once again the 200DMA at 2,585 has proven a key support for the S&P500. “It was the week when one bad thing led to another, it was a perfect storm,” said Jim Paulsen, chief investment strategist at Leuthold Weeden Capital Management. “You took the starch out of the FANGs, you saw banks, industrials, discretionary companies reacting to negative news. What investors are not pricing in is a potential impact on companies’ profit margins." On Monday, the perfect storm had faded, although it remained to be seen if this was just the eye of the hurricane. What prompted the surge: the most commonly cited reason is that jitters over brewing trade tensions between the U.S. and China have again eased, after Treasury Secretary Steven Mnuchin told Fox News that he’s "cautiously hopeful" the U.S. can reach a trade deal with China that will avert the need for Trump to impose up to $60BN in tariffs on China - of course, what else would he say? There was also renewed optimism that the United States and China are set to begin negotiations on trade, following reports in both the FT and WSJ, further easing fears about a trade war between the world’s two largest economies. MSCI’s world equity index turned positive on the day, having earlier hit its lowest level since February 9, after a Wall Street Journal report that Treasury Secretary Mnuchin was considering a visit to Beijing to begin negotiations. All of the uncertainty has kept the once-reliable dip buyers on the sidelines this time. Consider: as Bloomberg notes, the S&P 500 has closed lower than the midpoint of its daily range for 10 straight days, the longest stretch since at least 1982. That suggests traders are finding reasons to dump shares in the afternoon rather than buy dips. That sentiment may have reversed this morning, however: "It appears that the market is not expecting a full-blown trade war, and a currency war for competitive advantage is not a likely option at this moment," said Mizuho's Ken Cheung, who will clearly retract and say the opposite should futures reverse their gain and slump. "Risk sentiment, as being reflected by Asian equities, and further responses from the Chinese authorities to the trade war will drive the market." Also overnight, as we reported previously, the U.S. and South Korea reached an agreement on revising their trade deal, with South Korea avoiding steel tariff, which was also to be expected, as the target of Trump's trade war - it has become especially obvious by now - is not Europe, and not all of Asia, but simply China. As a result, S&P futures are sharply higher in early trade, and the S&P trying to undo all of its 2.1% losses from Friday, although it may have a harder time to offset last week's 6% loss, which was the biggest weekly drop since early 2016. European shares headed for their first gain in four days as investors assess the latest developments in a trade conflict between the world’s two largest economies. European bourses are higher across the board (Eurostoxx +0.4%) with the exception of the FTSE MIB (-0.3%), shrugging off Friday's negative sentiment. Sectors are making broad gains, healthcare is outperforming after a positive drug update from Roche (+1.6%) and energy is underpinned despite slightly softer oil prices. 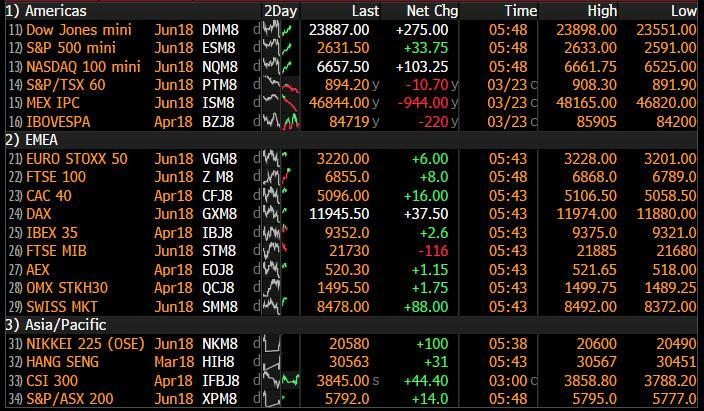 Asian markets also stabilized, with the ASX 200 down -0.5% led lower by its largest-weighted financials sector after the harsher losses seen in its US counterparts, while the Nikkei 225 fell to a near 6-month low, before staging a late rally back into positive territory, closing 0.6% higher after dropping -1.3%. Elsewhere, Shanghai the Shanghai Composite dropped -0.6%, weighed by trade tensions and rising Chinese money market rates (HKD 12-month HIBOR at 9-year high), while the KOSPI (+0.8%) bucked the trend after news that US and South Korea agreed in principal to a revised FTA and with South Korea to be exempted from US tariffs. In macro and FX, the risk on sentiment sent the yen sliding from a 16-month high as calm returned, if only for the time being, to world markets amid signs U.S.-China trade frictions may be easing. The USD/JPY rose 0.3% to 105.10 after earlier falling to 104.56, lowest since November 2016. "Risk aversion seems to have come a full circle with the first reaction to U.S.-China trade tensions last week, and it may be difficult to buy up the yen further without additional negative factors,” said Koji Fukaya, CEO at FPG Securities. On the other side, Daisuke Karakama, chief market economist at Mizuho Bank in Tokyo said that “markets are now in the phase of waiting for Nikkei stock average to fall below 20,000 and USD/JPY to drop towards 100, so it’s meaningless to give specific projections before those levels." Meanwhile, bond markets this week will see another deluge of issuance, and bond traders will be tested this week as the Treasury will auction about $294 billion of bills and notes, the largest slate of supply ever. China last week did not rule out scaling back its purchases of U.S. debt as part of its response to proposed tariffs. The 10-year yield held near 2.84%. Concerns over the formation of a new anti-establishment government in Italy weighed on Southern European debt on Monday, though this was counterbalanced to an extent by a ratings upgrade for Spain late on Friday. Italian bonds underperformed, with 10-year yields rising as much as 4.5 basis points in early trade, on further signs the anti-establishment 5-Star Movement and the anti-migrant League might explore an alliance to form a government. But the euro was still on a positive trajectory, hitting a 10-day high of $1.2393 at one stage. In commodities, international Brent crude futures opened above $70 per barrel for the first time since January but the gains could not be sustained as the ongoing trade disputes weighed on global markets. Spot gold had hit five-week highs early but turned negative as the session wore on and was marginally lower on the day at $1,345. In M&A, Smurfit Kappa rejected International Paper’s revised takeover bid, while the U.K.’s JD Sports Fashion agreed to buy Finish Line in a $558 million deal. Red Hat and Paychex are among companies reporting earnings today. U.S. President Donald Trump is poised to take his most aggressive actions yet against Russia on Monday, when he’s likely to announce the expulsion of dozens of diplomats in response to the nerve-gas attack on a former Russian spy living in the U.K.
cautious on 2yr JGBs amid expectations for an increase in auction supply. European equities are higher across the board (Eurostoxx +0.3%) with the exception of the FTSE MIB (-0.3%), shrugging off the negative sentiment on Wall Street and Asia dictated by looming trade disputes between China and the US. Sectors are making broad gains, healthcare is outperforming after a positive drug update from Roche (+1.6%) and energy is underpinned despite slightly softer oil prices. In terms of individual movers, Fresnillo (+5.5%) is the outperformer in the FTSE100 after an upgrade from Goldman Sachs whereas Smurfit Kappa (-4.3%) is the laggard following its refusal of the takeover offer from International Paper. In FX, Nzd/Usd nudging back up towards the 0.7300 level on a surprise NZ trade surplus and broader uptick in risk sentiment overnight as global trade war fears wane somewhat, with market contacts also reporting some decent buy orders in Nzd/Jpy as Usd/Jpy bounces off new recent lows not far off 104.50 to just over 105.00. Note, however, the headline pair has been capped amidst hefty option expiry interest at the big figure today and on Tuesday (around 2.5 bn in total). Aud/Usd is back above 0.7700 and approaching 0.7750 despite a couple of short trades of the week via crosses (vs Jpy and Cad), while Cable has breached the 1.4200 level on a mixture of hawkish BoE impulses and Brexit transition deal optimism. On that note, contacts also note some stopsales in Eur/Gbp from circa 0.8730 to 0.8723, which is the low of the range up to 0.8743. Nevertheless, Eur/Usd remains firm and has popped above 1.2400 on extended gains from trend-line support (1.2349) and its 30 DMA (1.2337). Usd/Cad looking at bids near and under 1.2850 amidst a broadly soft Greenback as the DXY remains sub-89.500 and trade/protectionism concerns continue to weigh. In commodities, oil futures are modestly lower, albeit remaining in close proximity to recent highs, as price action is centred around China with WTI crude futures failing to hold above USD 66/bbl with demand sapped as the debut of CNY-denominated oil futures contracts stole the limelight and rose 6% in early trade. In the metals bloc, gold is range-bound at around 5-week highs as a subdued greenback and risk-averse tone kept the safe-haven afloat, while copper weakened alongside losses in Chinese metals prices in which Shanghai Rebar dropped to its lowest since July. The seeds for the opening salvo of a trade war appear to have now been sown with President Trump and China trading blows, and it feels like it’s only the start with China signaling a willingness to go toe-to-toe. This transpired in a week in which the Fed showed that it remained committed to staying on a gradual rate hike course, concerns that global growth could be starting to roll over following the latest flash PMIs, the centre of the bull market – the tech sector – roiled by data leakage accusations at the hands of Facebook, and finally the White House revolving door continuing with the appointment of John Bolton – a man who had strongly supported an invasion of Iraq - as the national security advisor. That perfect storm of events resulted in some of the worst weeks for risk assets in years. Using the S&P 500 as an example, the index fell -5.95% last week, the biggest weekly decline since January 2016. Every sector closed lower so there was nowhere to hide although tech fell a fairly staggering -7.88%. The broader index is now easily in the red again for the year (-3.19%) and it also means that we have seen three separate 5% dips for the index in the last two months. What perhaps stood out the most about the price action last week was that any buy the dip mentality appeared to just disappear. In fact, that has been the case for the last two weeks with the S&P closing lower than the midpoint of its intraday range every single day. That’s the longest streak since at least 1982. Across other markets, the Nasdaq 100 – which bore the brunt of the Facebook news - fell -7.29% and the most since August 2015. The export heavy Nikkei and DAX fell -4.88% and -4.06% respectively. The Shanghai Comp was down -3.58%. Indeed, it’s now difficult to find a market which is positive YTD, although the FTSE MIB is one which can still just claim that. Meanwhile, it might not have been the volatility spike of early February but the VIX still rose over 9pts last week and closed just below 25 on Friday which is the highest since February 13th. Remember that the VIX average through the whole of 2017 was about 11. Elsewhere, credit certainly wasn’t immune. Moves for CDS indices are complicated by the rolls however CDX IG was still 15bps wider last week and is now at the widest since December 2016, while iTraxx Main and Crossover were 12bps and 41bps wider last week, respectively. Cash European and US high yield spreads were 21bps and 14bps wider. Given all the above, you might have thought that Treasury yields would be markedly lower. However, 10y yields were just 3bps lower last week having closed at 2.814%, and in fact they have closed with a 2.8% handle for 21 straight days which is fairly remarkable all things considered. Bunds were ‘only’ 4bps lower last week however it’s worth noting that they are now 24bps off their YTD yield highs. Unsurprisingly, the weekend news flow is filled with reaction to last week’s trade war developments. China’s Vice Premier Liu He, following a phone call with US Treasury Secretary Steven Mnuchin, said that “China is prepared and has the ability to defend its national interests”. China has also suggested that it may issue an official complaint to the WTO about Trump’s steel and aluminum tariffs, with China not exempt from the levies. Remember that Trump has already threatened to remove the US from the WTO. Interestingly, Mnuchin has also been reported as saying that he is hopeful that the US and China can come to an agreement that will “forestall the need to impose the tariff’s that Trump has ordered on at least $50bn of goods” according to Bloomberg. The article quotes an interview Mnuchin had with Fox News, with the Treasury Secretary also quoted as saying that the US will proceed with the tariffs “unless we have an acceptable agreement that the President signs off on”. So perhaps some signs of a softening stance. This morning, the US and South Korea have reached an agreement on the principles of amending their bilateral trade deal, which includes the US permanently exempting South Korea from the steel tariffs. In return, South Korea will set quotas for steel exports to the US and will be more flexible on imposing safety / environment regulations on US made cars. In Asia, the Kospi is up +0.34% while other bourses have pared back steeper losses with the Nikkei (-0.33%), Hang Seng (-0.57%), ASX 200 (-0.45%) and Shanghai Comp. (-1.64%) all down as we type. There’s better news for US equity futures with the S&P 500 currently up +0.55%, while Treasury yields are also up close to 2bps. There’s also been some non-tariff talk over the weekend with the newly appointed PBOC Governor Yi noting that China has three major tasks for the financial system – “i) implement prudent monetary policy, ii) push forward financial reforms and opening up and iii) win the battle against financial risks”. He added that the “opening up of the financial sector must be accompanied by the development of financial regulations” and it will proceed in coordination with reforms in China’s FX rate mechanism and capital account convertibility. Elsewhere, the WSJ has reported John Williams is the front runner to succeed William Dudley as the Head of the NY Fed. So, while it’s hard to see anything other than trade war developments really dominating markets this week, it’s worth noting that we do also have some inflation data due out in the holiday-shortened four days ahead. Specifically, Thursday’s PCE report in the US is scheduled. In terms of what to expect, the consensus is for a +0.2% mom core and deflator reading for February. The former would imply a jump of one-tenth in the annual rate to +1.6% yoy. Our economists also expect a +0.2% core print and they note that the report should take on a little more focus given the recent upgrade in the Fed’s forecast to above 2% core PCE for 2019. As a reminder too, the March data is when we see the wireless services print annualized which should add about 20bps and 10bps to the annual core CPI and PCE prints, respectively. Away from that we also have some flash March CPI data due in Europe this week with Germany on Thursday and France and Italy both reporting on Friday. Other than that, there is a decent flow of Fedspeak this week which if anything could help shape where FOMC participants’ median dots are now. Dudley (neutral) and Mester (hawk) kick things off today, followed by Quarles (neutral) and Bostic (neutral) on Tuesday, Bostic again on Wednesday and then Harker (dove) on Thursday. So expect the market to be looking out for where their rate expectations lie. Quickly recapping Friday, in terms of central bankers speak, the Fed’s Bostic and Kaplan both noted their base case was three rate hikes for this year (i.e. 2 more), but are “open minded and we’ll see how the year unfolds”. Elsewhere, the Fed’s Kashkari noted he supports the recent rate hike because it “represented continuity” at Powell’s first meeting, but added that the data does not support a rate hike at this point. In the UK, BOE’s Vlieghe noted “the current central outlook is….consistent with one or two 25bp rate increase per year over the forecast period”. Datawise, in the US, the February core durable goods orders (+1.2% mom vs. +0.5% expected) and core capital goods orders (+1.8% mom vs. +0.9% expected) were both above consensus. The February new home sales print fell -0.6% mom to 618k (vs. 620k expected) while the final reading for France’s 4Q wages growth was slightly higher at +0.2% qoq (vs. +0.1% expected).